FLORHAM PARK, N.J. (AP) ��� The New York Jets got some help for their banged-up secondary at the NFL’s trade deadline. 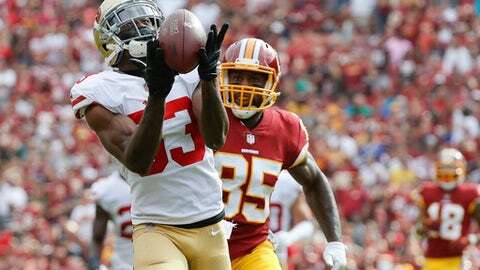 Cornerback Rashard Robinson was acquired Tuesday from the San Francisco 49ers for a fifth-round pick in next year’s draft. Robinson was a fourth-rounder last year who was a starter for San Francisco, but has been penalized often during his young NFL career. He had 61 tackles, two interceptions, 15 passes defensed, a forced fumble and one fumble recovery in 22 games with the 49ers. Kerley played with Robinson last year in San Francisco during the cornerback’s rookie season. It was unclear if Robinson would be available for the Jets’ game Thursday night against Buffalo. He provides depth – and a potential starter – for New York. Cornerback Morris Claiborne is dealing with a sore foot and Buster Skrine is in the league’s concussion protocol, leaving their availability for the game against the Bills uncertain. Jets rookie safety Jamal Adams was fired up to hear the news that his former LSU teammate was joining him in New York. Robinson has had issues with penalties in his brief time in the NFL, having been called for 10 this season – with eight accepted. His 17 accepted penalties since the start of last season are second in the NFL only to Tampa Bay offensive lineman Donovan Smith, who has 18. Robinson started San Francisco’s first seven games this season, but was recently demoted. At 6-foot-1 and 177 pounds, he has outstanding speed and a tall, wiry frame. Robinson gets a fresh start on defense with the Jets. The 22-year-old Robinson has had to overcome off-the-field issues, too. He played at LSU for two years, but was suspended during the 2014 season because of academic issues and a failed drug test. He was also arrested in 2015 and charged with unauthorized entry of his former teammate’s apartment. He never played another down for the Tigers. The Pompano Beach, Florida, native then enrolled at Broward College to train for the draft. It was the second trade of the day for the 49ers, who acquired New England backup quarterback Jimmy Garoppolo for a 2018 second-round pick. The deal was the first between the teams since 2006, when the Jets acquired running back Kevan Barlow from the 49ers for a fourth-rounder. It also came just moments after Bowles said during his post-practice news conference that he didn’t anticipate any moves by the Jets before the deadline. He was surprised when a reporter told him, after seeing it on Twitter, that New York acquired Robinson. Bowles was then asked what he knows about Robinson as a player. “Nothing right now,” the coach said. To make room on the roster for Robinson, the Jets waived defensive lineman Ed Stinson, who had been dealing with a neck ailment. AP Pro Football Writer Josh Dubow in Santa Clara, California, contributed.